The Wizard of Oz sweetheart, Judy Garland was one of the most photographed women of her time when digital cameras weren't around. Judy Garland seemed to have a glow about her which made her photographs radiate her beauty, charm and heart. Judy Garland occupies a one-of-a-kind, iconic position in movie history, thanks to her role as Dorothy in The Wizard of Oz, and her beautiful singing voice. 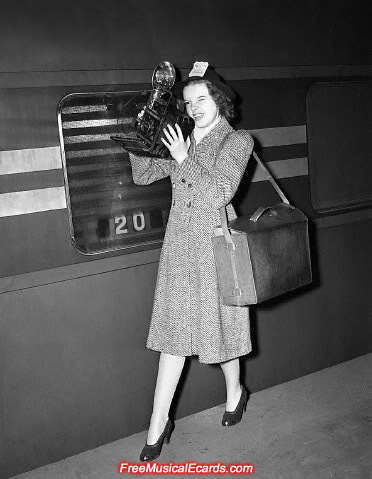 Photographer Judy Garland taking shots with a bulky 1930's style camera. The superstar singer-actress spent most of her life in front of the lens, and this time she got a taste of what it was like behind the lens.